A unique E Ink writing device called the Pomera is headed to the Unites States later this year if its crowdfunding campaign gets funded. A company called King Jim has been selling their line of E Ink typewriters in Japan for the past decade, and now they’re trying to bring their pocket typewriter to the US. They launched a Kickstarter campaign a few days ago to raise funds. The early bird offer for the Pomera DM30 is priced at about $349, which is 30% off the retail price that’s close to $500. That’s a fair bit of coin for what is essentially a low-end E Ink screen with a keyboard attached, but these kind of devices are usually pretty expensive and it does have its own unique software. There’s also the Freewrite E Ink typewriter that sells for about the same price as the Pomera at full retail, but it’s more like a traditional typewriter. 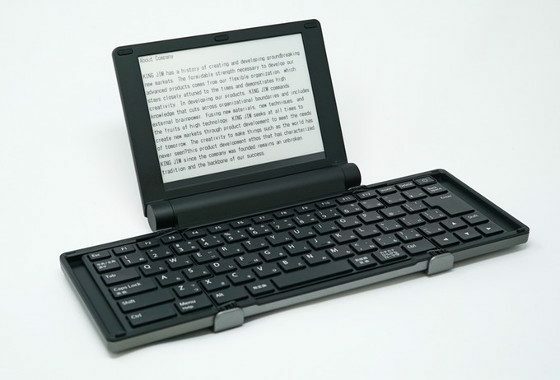 For considerably less you could get an Onyx Boox ereader and a Bluetooth keyboard and achieve the same kind of thing, but that won’t fold up into a nice tidy package like the Pomera. The Pomera DM30 has a 6-inch E Ink screen with a resolution of 800 x 600. It runs on AA batteries that last for up to 20 hours of use. The device has 8GB of storage space, plus there’s a microSD card slot for expansion. The software offers various layout settings, with customizable font sizes and line spacing options. It can invert text for a black background with white text. You can create custom keyboard shortcuts and choose different page types (with optional line numbers and page lines) and it can create tables in .csv format. There’s also a calendar for adding notes and to-do lists. Pre-orders are expected to ship in November. What if we connect a standard keyboard to our android ereaders through the usb port? They usually don’t support OTG but Bluetooth keyboards work fine. I didn’t know you could type on an Onyx Boox device. I learn so much from this site.